The idea of marriage, and especially weddings, has turned into a pseudo, reality TV show which warps our worldview and perception of love. Women are told from a young age you must get married or fear for your emotional, financial and economic security. Marriage has become a fear mongering tradition poisoning the most uncontrollable and wonderful aspect of our being, our ability to fall in love. I don’t think love is an exclusive, one-size fit all activity. Love comes in all different shapes, sizes and lasts for mysterious lengths of time. Foolishly, marriage tries to define, control and institutionalize love. Love is free, unconfined and endless. Despite all this, I am married. I love unconditionally, fully and without fear. Getting married wasn’t something I had always planned on, dreamed about or even scheduled in for some designated year in my life. It just occurred. It was a blessing, a journey and a self-discovery. For us, getting married was about us. It felt right when it was just us standing up there. 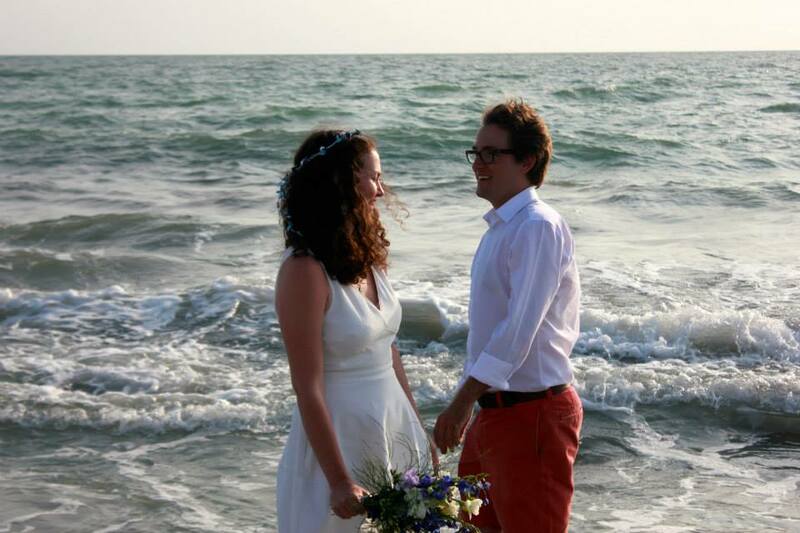 The guy who sorted out our section on the beach, after the ceremony said, “You guys just showed up holding hands, laughing and relaxed, It’s really nice to see that.” I couldn’t imagine getting married where the circumstances were anything other than happy and relaxed. What they don’t tell you is the process of marriage can become a lot about everybody else. There are feelings, expectations and disappointments, which don’t reflect on you but still have to be accounted for. I looked at the traditional vows, and just immediately knew that wasn’t a representation of what we were doing. You have to keep it about the ‘us‘ that you started for, not the dream you had of getting married, anyone else’s ideas, let alone the state or church’s concept of marriage. I was relieved when we were done with the ‘getting married’ segment of our life story because we returned to being us again. It took me off guard how many times I was congratulated, and for something that took no effort on my part! I did not work to find a partner, I did not try to fall in love, it didn’t owe much congratulations. To congratulate me on getting married made me feel as though I had ticked something off from a list of expectations, I didn’t know were following me around like some kind of silent, grim reaper waiting for me to succeed in the must-dos of womanhood. I hadn’t been to another wedding so ours felt like a one-off exclusive activity. In the moment it meant a lot to stand up and straight forwardly say what we needed to say to one another. Having said that, it didn’t magically change our love or make it feel like a safe love. I’m thankful for that. We didn’t get married to feel more connected, to feel grown up or to achieve some life goal. We got married because it was us, and we liked it being us, we wanted that us to continue and that was it. I want to take the opportunity to personally congratulate us on fulfilling what we set out to do! Marriage, somewhere, along way down the history of its existence simply was routed from love. I don’t know why the love I share with one person is so much more significant than the love I feel for other people. I want to get my beloved friends and family, stand on a beach and stare into each others eyes, and just lay it bare. Say the things that need to be said to one another and take a second to appreciate the insane nature of love in one unrivaled therapeutic and uplifting moment. I invite you all to do this with a loved one, and let me know if you do, so I can congratulate you on holding on to what’s important to you, loving fearlessly and saying everything that needs to be said without falling into anyone else’s framework of what it is to love and belong. How do you feel about love, belonging & the baggage that comes with the history of marriage?